A friend jokingly suggested that I might be worried that my Model S might catch fire. I was not aware of this problem so took it upon myself to investigate the issue. It seems that a small number of fires had occurred some years ago and this was caused by large sharp heavy debris in the road being flung up at speed and piercing the batteries. However the car will alert the occupants so that the driver can pull up safely. Unlike a petrol fire, the batteries will not erupt into a wall of flames. This problem was solved by updating the software to increase the ride height and by fitting a titanium panel underneath the car to protect the batteries. It was also retro fitted to older vehicles. Samsung’s problem of their latest Note smart phones was caused by a school boy error – they forgot to account for the expansion as the battery charges. 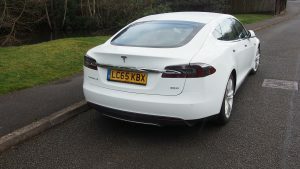 Electric cars such as this Tesla hatchback may become a familiar sight in London. Banning diesel engines in London would bring an end to public transport on the surface and the tube network could not cope with the extra passenger numbers. Eventually a tram or trolleybus network would be established, and chargers for electric cars will be installed at many parking spaces. 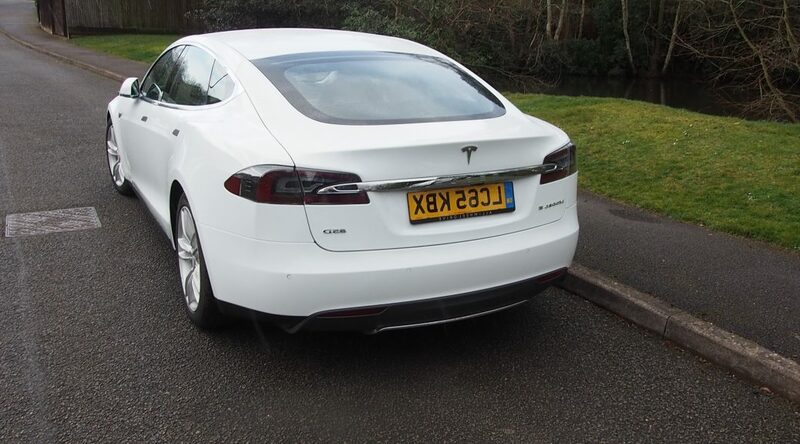 The threat of change is a wonderful stimulus to development and the threat of combustion engines being banned from town centres will certainly stimulate electric car research and development.